The request for loading a particular class starts from Application Class Loader. Application Class Loader checks in the cache whether the class is already loaded ,if not then delegated the request to Extension Class Loader. Extension Class Loader also checks in the cache and if not found , delegates the request to Bootstrap Class Loader. Bootstrap Class Loader also checks in the cache , if the class is not found , it checks whether the class is to loaded by it or not. If the class is not a part of API ie rt.jar , etc that means it is not to be loaded by Bootstrap , the request is delegated back to Extension Class Loader. Extension Class Loader will search in the extension (ext) folders of jdk or jre. If the class is not found it will delegate the request back to Application Class Loader. thus the request will start from Application class Loader , go up the hierarchy and come back to Application Class Loader , it has to load the class , eg. User defined class. Classes loaded by Class Loaders up in hierarchy will be visible down the hierarchy. Class Loaded by Bootstrap Class Loader will be visible to Extension Class Loader and Application Class Loader and if a class is loaded by Extension Class Loader it will be visible to Application Class Loader and the class will not be visible to Bootstrap Class Loader. if a class is loaded by Application Class Loader ,it will not be visible to both Bootstrap and Extension Class Loaders. If a class is loaded by a Class Loader , it will not be loaded again by any Class Loader down the heirarchy. The primordial class loader is virtual machine implementation whereas class loader object is running Java application component. If JVM is implemented using/in C programming language , then the primordial class loader will be also a part of C program whereas Class Loader objects are Java API classes written in Java which are compiled to class files and loaded and instantiated like any other java class object. The primordial Class loader (Bootstrap Class Loader) loads trusted classes, including the classes of the Java API.It loads the Java API classes ie rt.jar, core.jar, i18n.jar ,etc.It is not a subclass of java.lang.ClassLoader. Note: As Bootstrap class loader is the implementation of JVM and not the child class of Class Loader , it displays null. Under this category we have Extension Class loader and Application(System) Class loader.These are subclass of java.lang.ClassLoader. It loads the classes from the jars which are present in the extension directory of JRE ...\Java\jdk1.6.0\jre\lib\ext or ...\Java\jre6\lib\ext. It is used to introduce new functionality like mysql driver jar required to load driver for jdbc connection. It is also known as System class loader.It is the default class loader. it loads the classes of the classpath. If mysql jar is added to the classpath , it will be loaded by Application class loader. 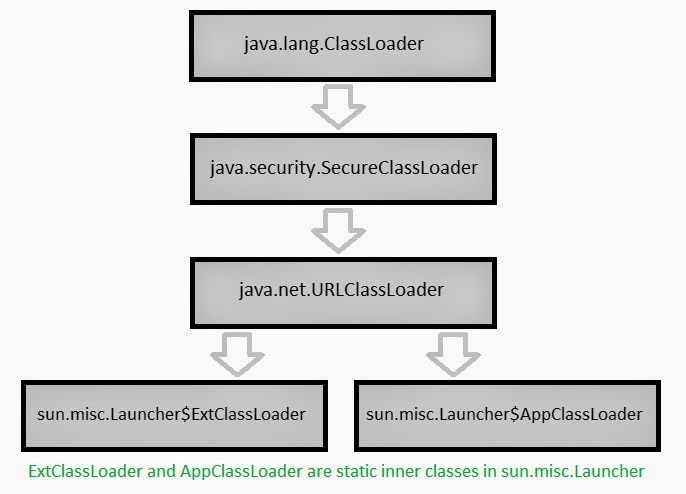 JVM has two types of class loaders 1) Primordial (Bootstrap) Class Loader and 2) Class Loader Objects. Class Loader Objects are Application Class Loader and Extension Class loader. 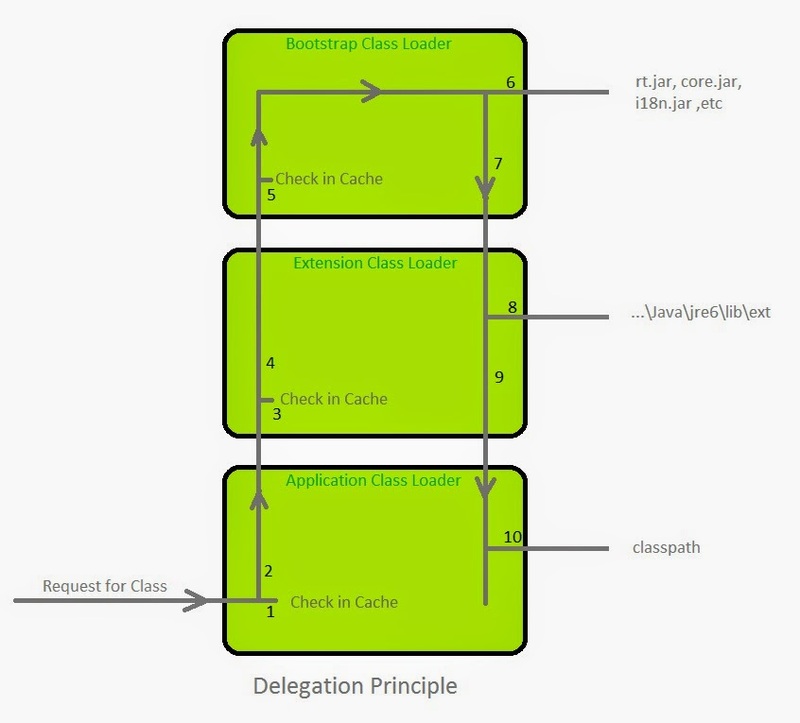 JVM follows three principles , while loading a class , delegation principle , visibility principle and uniqueness principle.